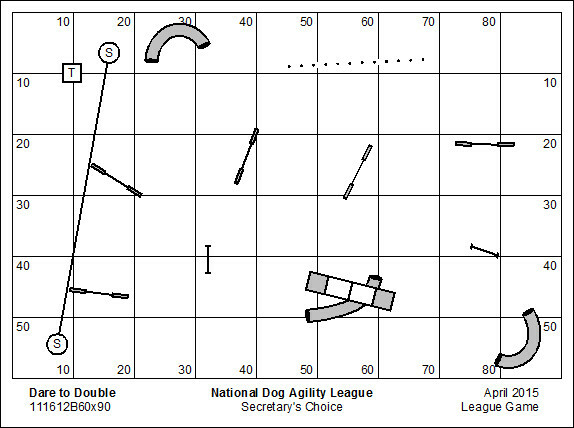 We are happy to finally publish the results for the National Dog Agility League competition for March 2015. April is a month in which we are treading water, as we build the founders coalition for the organization. Today and tomorrow invitations will be going out to our league clubs to join a discussion list on Yahoo. We have quite a bit of work to do to define the constitution of the organization. In any case, we have two games scheduled for the month of April. 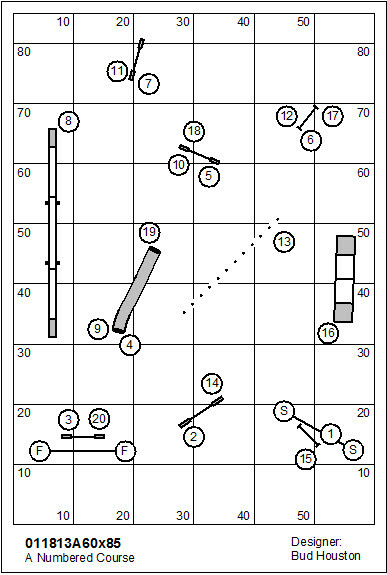 These are described below, with links to download the scorekeeping workbooks. 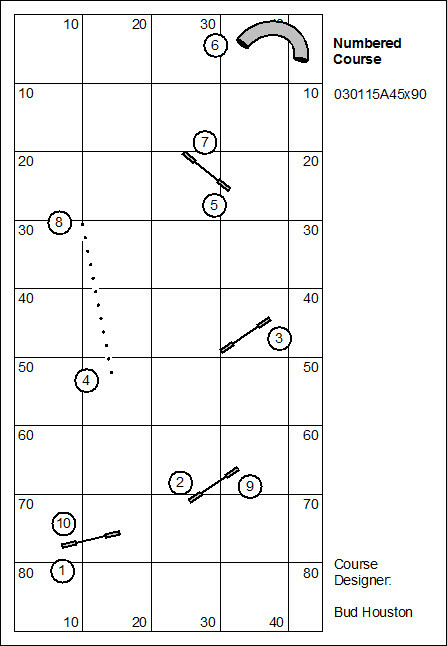 Download Event Workbook ~ The workbook has the score sheet, the course map, and a briefing for this game. The Box game is a sequencing game that provides for bonuses for the dog working at a distance. The Box Game is scored Time, Plus Faults, Less Bonuses. This course is designed for Novice dogs to be successful and test basic skills. However, the game invites handlers of very advanced dogs who want to shoot for the high score on a ripper race track of a course. Download Results ~ This game was originally played in November, 2012. You can download existing results here. Dare to Double is a dog’s-choice game. The objective is to score as many points as possible, repeating a doubling obstacle on course (traditionally the A-frame) as often as time allows. The dog risks losing half his points if the A-frame is faulted! The dog must get to the finish obstacle before course time elapses or be penalized. Dare to Double is score Points, Then Time. As we await the end of March, whereupon we’ll find out who are the founding clubs for the National Dog Agility League, I am conducting NDAL competition here at my training facility. We have a few artifact courses to choose from, some of which have results. Of course I could have designed a new course or game. But I wanted to demonstrate how to use the catalog to record scores against a game that has already been played. The course we are running this week was originally run a bit over two years ago. There are only six or seven recorded results. But these will be rolled up with new results. I’ll share with you here the course we are running this week. This is what the page looks like when you open the “Catalog of Courses and Games”. 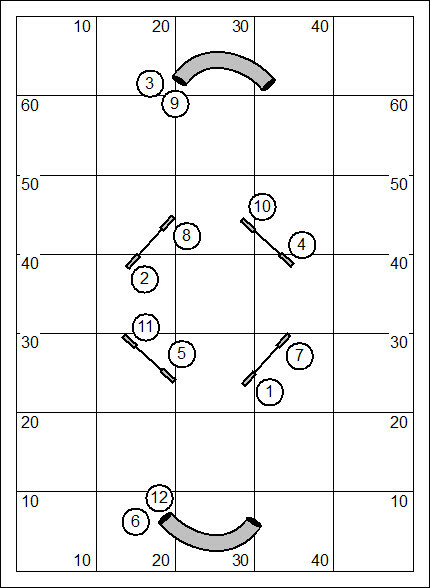 Aside from the course map there is also a link to download the scorekeeping worksheet and another to download existing results. This is a useful system for clubs that are engaged in league play. Rather than designing new courses, they can select courses that have already been designed and approved for play. Note that the filename indicates the size of the space for which the course was designed: 010413A60x85. This filename indicates that the game was originally played in January of 2013 for a field measuring at a minimum, 60′ by 85′. Each course run or game played under the aegis of the National Dog Agility League shall be recorded in the Catalog of Courses and Games. Any course or game in the Catalog is approved for use and reuse in competition. The results from dogs a course or game are held as historic results. When reusing an existing course or game in the Catalog new players will be competing with the historic players. The scores of historic players may enhance the Lifetime Performance Points earned by new players; and the first place dog might be either a new player, or a historic player. If a judge were to make any change in the detail of the Game (eg. changing the scoring basis) this variation would become a new and unique game with no ties or association to the original. National Dog Agility League (NDAL) competition is intended to be a recreational format for the sport of dog agility. Games and courses are reviewed in advance; [games and courses obtained from the Catalog of Games and Courses have already been reviewed and approved]. Only registered dogs engage in the competition. There is no application for League competition. Consequently there is no trial application fee. Each course run or game played under the aegis of Top Dog Agility Players shall be recorded in the Catalog of Courses and Games. Any course or game in the Catalog is approved for use and reuse in competition. The Catalog is under construction.